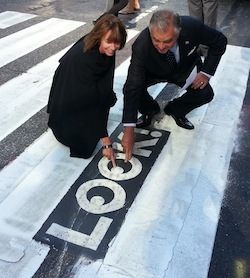 U.S. Transportation Secretary Ray LaHood joined NYC DOT Commissioner Janette Sadik-Khan at the corner of 42nd Street and Second Avenue this morning for the official launch of the city’s new LOOK! campaign, aimed at distracted drivers and pedestrians. Although NYC traffic fatalities are down 40 percent over the past decade, last year, 57 percent of fatalities were pedestrians. Half of all pedestrians killed in city crosswalks last year had the “walk” signal when they were killed. “Having the right of way does not guarantee your safety,” LaHood said, while standing beside an intersection that saw 75 pedestrian injuries between 2006 and 2010. “We need motorists to pay attention as they’re taking the turn,” Sadik-Khan urged. The LOOK! campaign uses funds from the Federal Highway Administration to install $60,000 worth of thermoplast markings at 200 intersections with high pedestrian fatality rates in all five boroughs. DOT began installing the crosswalk markings in July and has so far reached 110 intersections. The campaign also includes $1 million for a six-month ad campaign, targeting pedestrians with messages on bus shelters and drivers with ads on the backs of buses. Sadik-Khan said DOT will be evaluating the effectiveness of the campaign on pedestrian and driver behavior, noting that distracted driving trails only speeding and drunk driving as a contributor to injuries and fatalities. Distracted driving was a contributing factor in 3,092 deaths nationwide in 2010. In New York City, more than 9,000 were injured and 41 died in distracted driving crashes. Sadik-Khan said she was inspired by ubiquitous crosswalk markings in London that instruct pedestrians to look left or right. Many visitors to London are not used to the UK’s drive-on-the-left rules and habitually look the wrong way before crossing the road. The “eyes” in New York’s LOOK! markings more subtly direct pedestrians to look toward the flow of traffic. LaHood was impressed with the city’s latest campaign. “New York City DOT has done a great job, as they always do,” he said, adding that he plans to talk about the LOOK! program with officials as he campaigns against distracted driving nationwide. This is like the experiment where you are supposed to say the color with which a word is printed, but the word happens to be the name of some other color. The contradiction between textual and nontextual information can be baffling. I find the “Look!” markings in crosswalks a bit insulting, given that there are no equivalent markings directed at those who are actually causing the damage (the ads don’t count, as they aren’t as contextual as the ones directed at pedestrians). Can we just hang signs that say, “Please don’t kill people” from all traffic signals? Can some of the money be diverted to pavement markings in the lanes approaching the crosswalks which say “Slow the F*ck down!” or “Yield to Pedestrians, A**hole!” That would be addressing the real problem. Seems like this is mis-directed. From a safety standpoint, it would be prudent to encourage people to look both ways, even on one way streets. It would also be prudent from a legal standpoint. I can already picture the lawsuit from someone hit by a wrong way vehicle or bicycle claiming the city is negligent for suggesting to only look in one direction. I’m not finding this insulting at all. In fact, the location is directed right at the target audience. A person who already scans for traffic while crossing won’t even see the markings ( I only noticed them at a local intersection recently, and only because I was actively looked for them after reading about them ). The people who will see the markings are those with their heads buried in their electronic toys. This is exactly the group which needs to see them. Years ago, there used to be a “look both ways when crossing” campaign in elementary schools. I wasn’t aware that looking before crossing suddenly went out of vogue but that seems to be the case judging by the large numbers of people I see crossing without even glancing up from their gadgets. Sure, it’s true the real problem is motor vehicles who fail to yield to pedestrians (and cyclists). Nevertheless, that doesn’t excuse those on foot or on two wheels from watching out for their own safety. As a general rule, it usually takes both parties being distracted from what they’re doing for a collision to occur. The only exception to this is when motor vehicles end up in places where they don’t belong, like sidewalks, or even buildings. In those cases, I can’t fault pedestrians at all. If someone wants to have their head buried in their gadgets while on sidewalks, fine. But please look up when crossing the street. The life you save may be your own. Incidentally, I just came up with a great idea for the texters out there. When you’re in the middle of texting and come upon an intersection, just type #. The # character looks enough like an intersection to give the person you’re texting the idea that there will be a pause in your response until you safely reach the other side. At least there is some targeting of drivers. Would be an improvement to say that if you hit someone you lose your car or slow the heck down. Joe, the problem with that is that the texter will have no idea they are reaching an intersection. There really is no way to safely text and drive. That’s why it’s so east to spot a texting driver; they are usually weaving, fluctuating their speed, or braking erratically like a severely intoxicated driver. @SB_Driver:disqus I was referring here to texting pedestrians only. Texting while driving is a highly dangerous thing to do, period, and shouldn’t be tolerated at all. Same thing with texting while cycling. Doh! How silly of me, I should have realized. At the press conference, Sadik-Khan was asked how much of an impact this campaign could have, given NYPD’s lax enforcement of traffic laws. Really? What reporter had the insight to ask that? Streetsblog, perhaps? How silly. Government continues to subtly announce its incapacity to reign in aggressive driving. I wonder if there are studies that show that most fatalities from fatal collisions are caused by drivers with one or more moving violations on their record. DRIVING IS A PRIVILEGE, NOT A RIGHT and that should be the message backed up by enforcement, strong laws and proper prosecutions. That’s what I was wondering too. Does any other outlet besides SB care? As I was going to say before I clicked “send” early: The credit for the question goes to Gothamist’s John Del Signore. John Del Signore at Gothamist was the one who asked. The place that I have noticed these the most is at bike lanes, telling pedestrians to look right before stepping into the bike lane. I came across one of these about a month ago on 9th Ave at 55th/52nd/50th (cannot remember which) and I noticed a pedestrian actually stopped his forward progression as he started to walk over it. He backed up and read it again, and then looked at me (stopped on my bike as I was turning South onto 9th) because I was so fascinated with him stopping and looking. After I asked him if he liked it, if he thought it would work…he said “yes, it made me stop”. Then we both almost got run over by a car driving down the marked but as of yet ungreen bike lane on 9th. Overall, I think these are great. To me it shows DOT is thinking, not blaming but thinking. I wonder where this idea came from. We used to spray paint the words LOOK! back at dangerous crossings during the late 90s on the T.A. Century. I can even tell you a few of the places I painted it. Nice and all, but we need draconian penalties for drivers injuring people first and foremost. IMHO, knowing that you can end up in jail for couple of decades and be in debt for the rest of your life would be a better deterrent. Agree with Jeff – it might make some impact if the city was plastered with PSA’s on how dangerous driving is. … Except of course the car manufacturers would lobby like crazy against anything like that. I have a problem with how cute those little googly eyes look. Pedestrian safety is not a cute issue. Excuse me? Where does that figure come from? We’re often told a very different statistical story in Streetsblog, and a little informed rebuttal would be appropriate. This is exactly the lie that subdues people reading about the latest pedestrian or cyclist fatality, framing the status quo as morally tolerable, and effectively perpetuating it. I don’t know what LaHood’s point is, either, since the stencils are directed at all pedestrians. Whether you are crossing with a light or not, apparently you better LOOK or be killed by someone who will face no consequences from the same government overpaying for street stencils. It doesn’t matter if LaHood is considered “one of ours” or not. (He’s certainly not one of mine.) He needs to be held to account when perpetuating misinformation, or misleading information. That is the only way he will stop doing it. It’s in another article already.